but also to play at some of the most famous jam sessions in the world. My favourite hangout spot turned out to be Smalls, a small but reputable jazz club. One of the bigger surprises was pianist Jeremy Manasia, to me a renewed acquaintance: fifteen years ago he studied at the Royal Conservatory of The Hague, as did I. Back in those days his music was extraordinary, now his articulated playing and fresh compositions leave an even deeper impression. 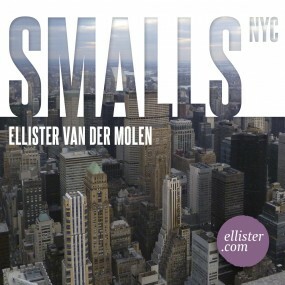 The encounter in Smalls has led to a series of concerts and recordings in Holland, Belgium and Germany, of which the cd Smalls NYC is the final result. Many people have contributed to the release through crowdfunding. Not only has this financially helped it’s realization, it has also showed your broad support. I thank you all! The four musicians of this group share an undogmatic passion for bebop and deriving styles. The compositions of both Jeremy and Ellister voice personal memories and experiences, and manoeuvre between tradition, trend and timelessness.